I hope you all had a wonderful holiday weekend! Since it is a Monday. And many of you are either on spring break or have kids who are on spring break, Monday-pancakes felt very perfect. And since I have been meaning to share this recipe and a cookbook from one of my fellow bloggers, well today is that day. These Elvis Peanut Butter Banana Pancakes by Katie Higgins, are just the thing to start a "hubba hubba" good day. With this tall tower of silver dollar pancakes, maple syrup glistening on top, you will have everyone at the breakfast table singing your praises with "thank you, thank you very much." So do not get "all shook up" about what to serve for brekky. And "don't be cruel," just make these pancakes. Because you "can't help falling in love" with them. How's THAT for silliness? The recipe..
Katie is one of my VGP girls. I find that she is supremely creative and loves a good healthy makeover on a classic treat. So I was happy to check out her first cookbook. I LOVE seeing all these talented bloggers scoring cookbook deals and watching their dreams come true. Especially young bloggers like Katie! Her cookbook, "Chocolate Covered Katie" came to me a few months ago and I flipped through the pages with wide eyes. It really is a fun book. Loads of colors, textures, flavors and sweet treats. The absolute best part about this book is that every single recipe has a photo. 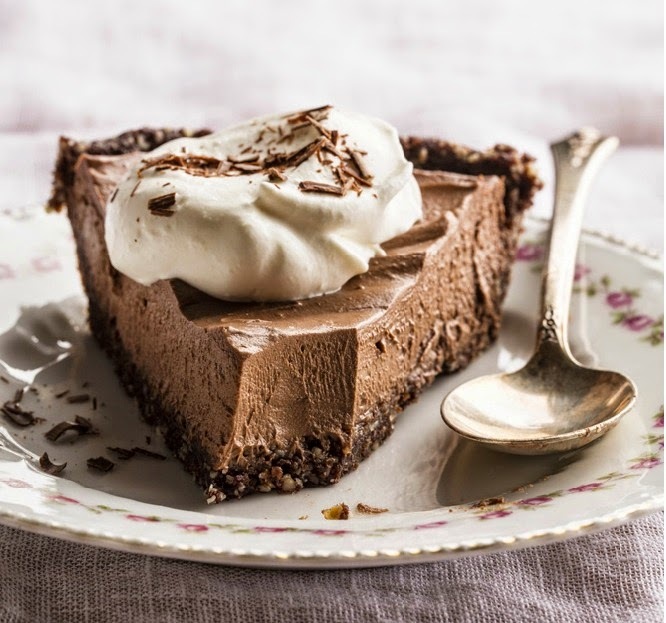 For dessert recipes, I think you will agree, that is pretty perfect. Katie's book would be so fun as a birthday gift or bridal shower present. It is a fun book and the recipes really do satisfy your sweet tooth -- just flipping the pages I start to swoon. Of note: Katie uses a lot of stevia and xylitol to keep the calories down, since that is the theme of her book (goodies that are secretly good for you and guiltless) - but since I never use those sweeteners I was a bit worried her recipes wouldn't translate for me. (I like to stick to maple syrup, coconut sugar and other vegan natural sweeteners). BUT she has an awesome conversion guide in the back of the book and anytime her recipes say "sweetener of choice" you can use whatever sweetener you like. Hooray for options. I am curious vegans, what sweeteners do you use on a daily basis? And grab Katie's pancake recipe below!.. Katie's peanut butter banana pancakes! 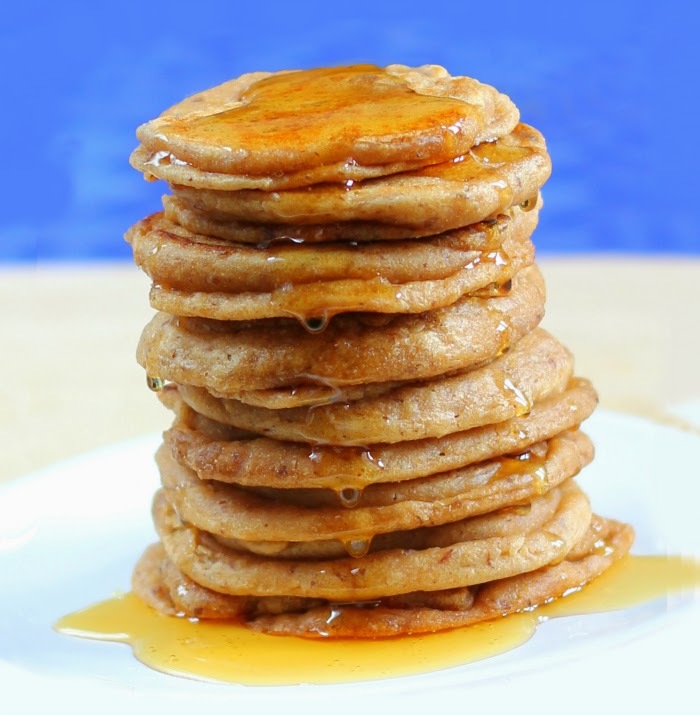 Fluffy silver dollar pancakes that are vegan. In a small bowl, combine the banana, peanut butter, vanilla, water, and 2 tablespoons liquid sweetener (if using instead of stevia) and stir until a paste forms. In a separate small bowl, combine the flour, baking powder, salt, and sweetener, stir well. Pour dry ingredients into wet, and stir together to form a batter. Lightly grease a medium skillet and place over medium heat. Test the heat of your skillet by throwing a few drops of water onto the surface; when the water sizzles, the pan is ready for the pancake batter. Drop small ladlefuls (about 3 tablespoons each) of batter onto the skillet. Cook until the edges begin to look dry. Immediately flip pancakes, using a spatula, and cook an additional minute, until golden brown.If the pancakes brown too quickly, lower the heat slightly. Repeat with remaining batter, greasing the skillet each time. Serve with your favorite toppings, such as pure maple syrup, peanut butter or banana.